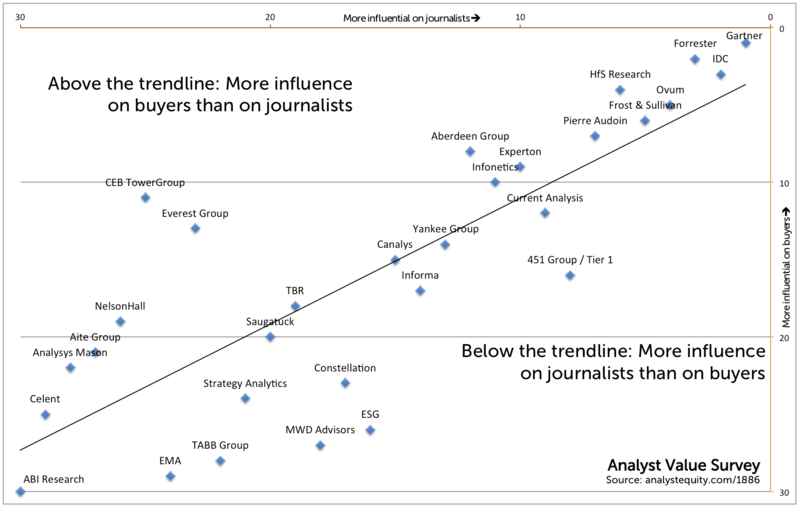 As readers of this blog will know, the Analyst Value Survey is the only public survey into how people value different analyst firms like Gartner and Forrester. I’ve been running it since 2001, and around 3,000 professionals read the results of the 2012 survey. You can see a summary at influencerrelations.com/1886 . I’ll present the 2013 results for the Analyst Relations Forum in London on October 3rd. It’s one of the most-requested sessions at the Forum. Participants to the survey will get even more detail into the results: I write a special summary for participants and reserve a complementary seat for each on a webinar to review the results. If you have an interest in analysts’ research please take part in the survey: http://bit.ly/AnalystValue . On average, the survey takes eight to ten minutes to complete and the data you get back will be fascinating! This entry was posted in 4. Align, track & educate, 6. Features, Influencers. Bookmark the permalink.